In my opinion there is an explosive and potential once in a lifetime opportunity coming up, which by my understanding is more a ‘when’ event and not an ‘if’ chance to make serious cash. None of this is investment advice and I do hold stocks and shares in this sector, so do your own research. Over the last few years I have enjoyed researching and investing in stocks/shares, it’s been great fun going on journeys along with some small caps exploring for oil, platinum, copper, gold etc from my home office, ups and downs. One space however stands out from any other, the more research I do, the more exciting it gets. I believe if you have one to two years, some patience you can multiply your investment by a factor of 10 with little effort. Whether its gold, silver or uranium you can invest in the actual product and/or the miners. The miners offer the greatest percentage rises though, let me explain. The following are made up figures to illustrate the point. Gold may be $1000 per ounce. A miner may mine it and it costs them $700 to get it out of the ground all in costs, therefor they make $300 per ounce. If there was a bull market and the price of gold doubled to $2000 per ounce, investing in Gold would give you 100% return on your investment in the product, from $1000 to $2000, nice! The gold miners however have gone from making $300 per ounce to $1300 per ounce giving them over a 400% increase in profitability… nicer! so they are leveraged to the price of gold and therefore offer larger gains (or losses) on the movement in price of gold (or any commodity). So for that reason investing in the miners in any bull market, be it gold, silver or uranium is one way to really leverage the gains. Others have gone over this much better than I could, if you are really interested then this video is a good summary of where we were last June, things have improved since then with more cuts. Since 2011 we have had a 7 year bear market, massive stockpiles and reduced demand from Japan creating ever reducing price pressure. 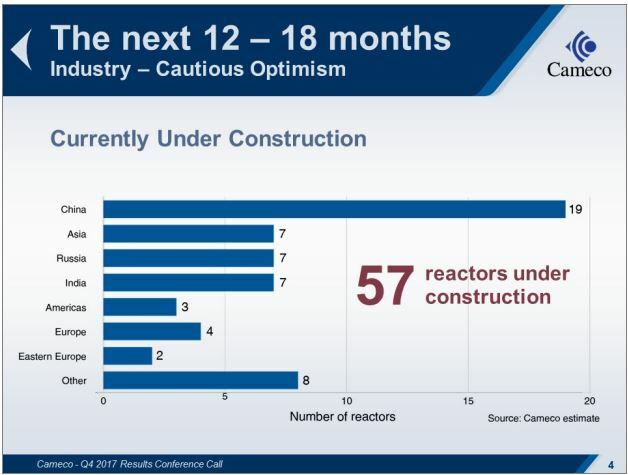 Utility companies have to come back to market this year and next to agree contracts after having been locked in for the last 10 years, China & India are building reactors, demand is on the increase. Conversely, miners & producers have cut production as they have been losing money during the recent years, it’s a pressure pot that will lead to prices exploding back to more reasonable levels over the next year or two. Japan are switching back on their rectors, France was going to close some down but back tracked and now hasn’t ruled out adding more. Green energy is a large part of the solution through renewals but base load energy is a must and already exists, signed up to and growing, its carbon free and cleaner for developing countries than the smog of coal. 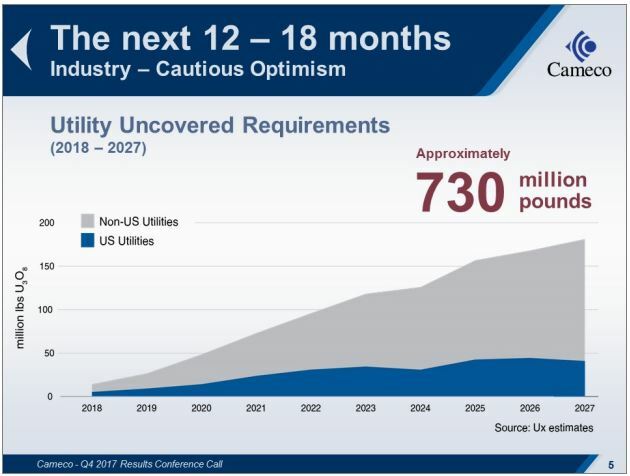 Furthermore the fast pace of moving to electric vehicles in the coming years will only increase demand on more energy creation for charging (and copper for making them). Getting exposure to this and miners the easy way would be investing in #GCL in the UK or $URA in the USA, these are ETF’s which hold shares in a broad basket of miners to save you doing individual research and letting you take advantage of the overall market in miners going up. These offer potential 5x to 10x returns in a bull market. Being more nimble, doing more research into miners and explorers could offer much larger gains (& losses) along the way. The largest increase in new nuclear reactors are in countries with regimes/governments that once committed – they will build them, no public opinion will sway them away. Base load energy from nuclear makes up 20% of USA power generation, yet the USA only produces 5% of that needed uranium fuel, they import 95% and much of that from non USA friendly countries, that’s a potential spark that could ignite the industry, as Trump is currently considering calls to enforce a percentage of fuel that must be USA mined, ie from 5% to 25%. Not that any of that is needed, by itself the numbers stack up. 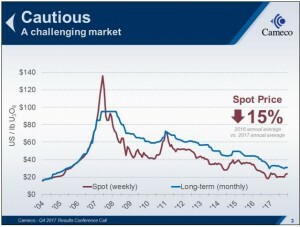 Most mines and futures producers need a price of over $50/$60 to make it profitable to explore and open new mines, the lead time for this is vast, getting permits for a new uranium mine is a very slow process, so offers those in the market already permitted huge returns initially, then later in the cycle explorers can offer huge potential. 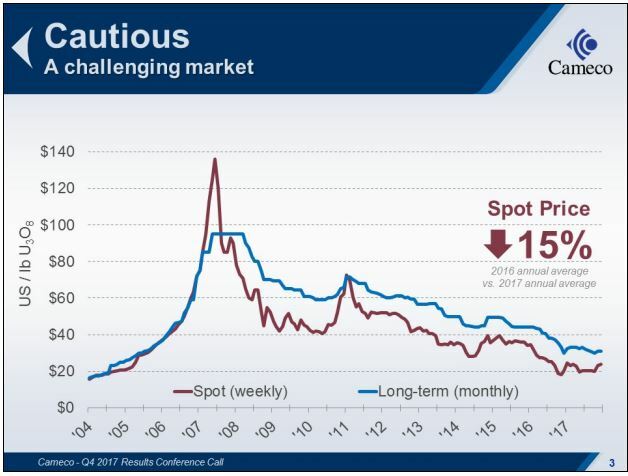 Currently the spot price of Uranium is around $22/lb, it has stabilised over the last 2 years and has been as high in the past as $130. The largest and second largest miners of Uranium have closed mines or made production cuts rather than sell at a loss into the market, why mine it for $40-$50 to have to sell it for $22, the spot price for Uranium has to go up, new reactors, production cuts and the decrease in old stockpiles is creating a pressure cooker soon to come to a head. 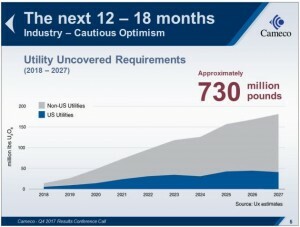 If Uranium goes from $22 back to a more realistic $50-$70 the potential gains are great, the potential for existing leveraged miners are well over 400%, if however it snaps due to a supply shortage, just like the last bull market, it can overshoot the necessary $60/lb and go initially much higher to $100+ before new mines/companies get traction and the price comes down again to a more competitive price point offering the more nimble investors life changing gains over a relatively short period. My expectation is within the next 2 years for an investment in GCL or URA to offer potential returns of 5 x to 10 x for the patient, better to be right and early on this one as the easy money will be made quickly as the rotation of money moves from indices to soft commodities, whether that happens in 2, 6, 8, 12 or 18 months I can’t be sure, but I’ll be ready. NB: As far as I am aware in the UK if you buy shares of any stock in a ‘Stocks and Shares ISA’ or SIPP you can protect all gains from capital gains tax.